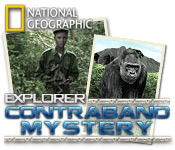 Explorer: Contraband Mystery is rated 4.4 out of 5 by 5. Rated 5 out of 5 by jil1 from Interesting HOG My review is based only in the demo, but I´m going to buy it right now. 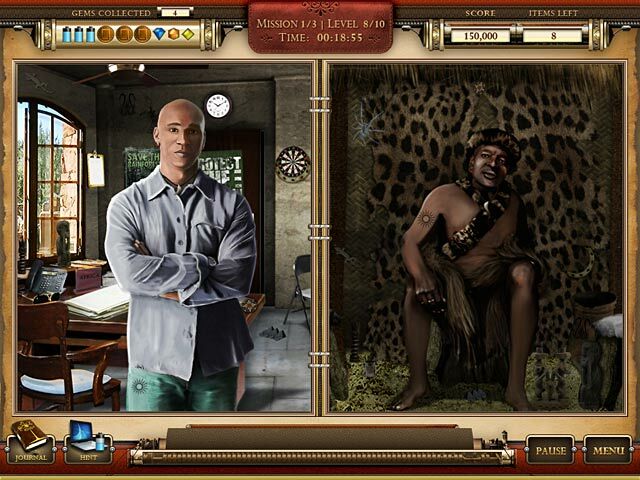 It is an actual game, interesting informations about diamonds, Africa and gorilas, that is the point I arrived. I´m a little tired of the games that are all about blood, vampires, souls, demos, witches and nightmares. This is different and I really like it. Diamonds in Africa is a serious subject, but people don´t talk about it. In the scenes some objects are too small to find, but you surely can do it. The quizz is interesting although I didn´t pay enough attention in the first mission. For the second, that I understood the importance of it, I tried to read more attentively. The mini games are the usual but funny. I recommend this game. Rated 5 out of 5 by Hookedonbigfish from A question of contraband This game had a few refreshingly different aspects about it in as much that you are a researcher for National Geographic and you must uncover clues that reveal smuggling operations surrounding three related criminal businesses, expose the ring leaders, bring the culprits to justice and write a report. The dialogue is topical and interesting with factual snippets. The graphics are clear bright and colourful in the first couple of cases but do darken considerably in the last case. The puzzles are similar to other games but the recreating of pictures is a tad challenging, spotting the differences are reasonable, discovering similar or pared items could be a bit hard and the intermittent requirement of answering questions could be a bit challenging if you haven't paid attention to the facts given. 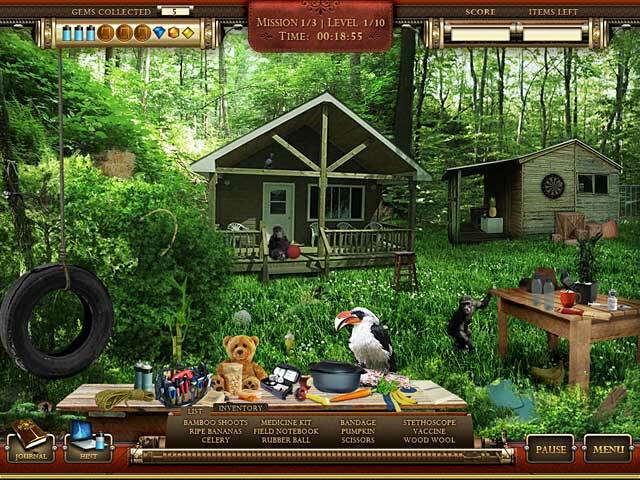 The hidden objects are mostly quite simple to locate but as the game proceeds and the scenes get darker then the objects are that much harder to find. The hunting for batteries for recharging hints, looking for coins and gems to increase your score is an added attraction together with the icons that reveal interesting facts about the case. Well recommended and well worth the money. Rated 5 out of 5 by JulieJay from Factual and Fun I enjoyed playing this HOG which is very factual on the topics (x3). There are 3 missions and they all contain HOGs and quizzes - 12 games in each mission. Items can be very small and integrated into the background which I know the majority of players dislike. It is only approx 1 1/2 hours long and based on the forum comments, some players even completed the whole game (with time to spare) in the demo. So overall I will give this game 5 stars simply for being that little bit different. I am going to recommend this game for at least the demo and you never know you might have played a game for free if you're as fast as some players (not me LOL). Rated 4 out of 5 by pennmom36 from Explorer: Contraband Mystery I didn't think I would like this game at first glance, the graphics seemed a bit archaic and it's features older, but all that changed when I went on my first mission. There are three different missions, that you must document contraband smuggling, in the mines and forests of Africa as well as the urban jungle back in the states. Because this is a Nat Geo Game, you will learn lots of interesting facts as you play the game. 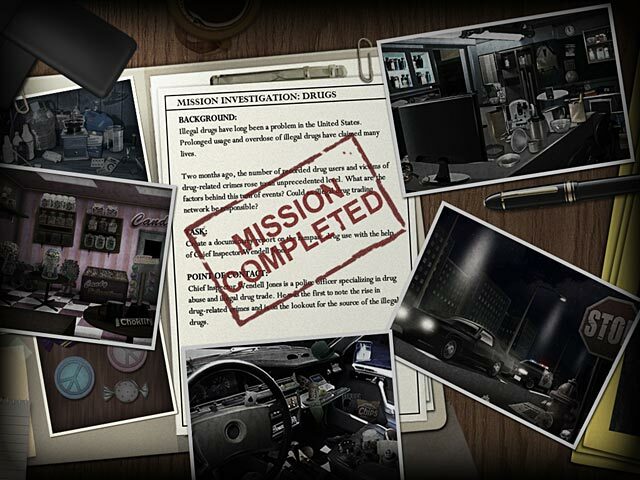 I started out with the Gorilla mission, but there is also a Drug mission and a Diamond mission. The Hidden Object Scenes are lists finds with no interactions available, some items require multiples of the same item, some are timed, most aren't. Each scene has 3 gems to find for extra points, 3 batters to find to recharge laptop hints, three badges and one handprint. The handprint will give you information about the subject of the mission which will be needed for a quiz later in the game. Finding items quickly or back to back will earn you extra points. There are so many mini games, and so far all of them are really entertaining. Some are puzzles requiring you to swap tiles and then rotate them to recreate the image shown to the left of the puzzle. My favorite games, were the "spot the difference" puzzles, and some of the differences aren't so easy to spot. Hopefully, the last two missions are as fun as the Gorilla mission. If you are looking for a HOG that has a bunch of puzzles and mini games, look no further, enjoy! Rated 3 out of 5 by azenalyn from Great idea but poor graphics I really loved this format with educational elements but just couldn't tolerate the poor quality graphics. Some HOPs were not clear and some things impossible to see in the dark backgrounds. I suppose this is due to the age of the game. Would love to see an update with clear and up to date graphics. The educational concept is fantastic and really wish there were more games like this one.